Hello guys! It's been donkey years since I've last wrote about something reflective. I don't know about you - but I used to feel quite lost on what to do (you see, I wanted to do everything). Your 20s set the stage for milestones — it is the time when you graduate from your school, kickstart your career, meet new friends and colleagues, tie the knot and perhaps even have a baby! As I've just transited from the early stages of the 20s, I think it'd be a lot easier if there was some sort of guidance before embarking on this journey. Whether you're looking for your first job or kickstarting your first startup, I hope this would be helpful to redirect your thoughts and live a purpose-led life! 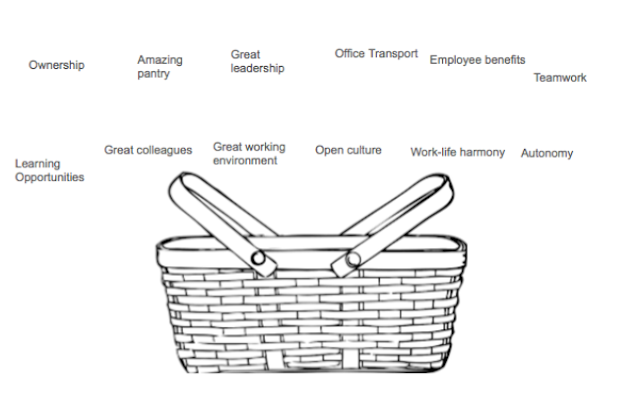 Here's my personal career 'shopping basket' - which is made up of a whole lot of items that I'll feel happy with. Ask a lot of questions about the company you're going into— otherwise you'll be wasting the company's resources and your own time. Every one has their own different priorities - some people can't take it when they take more than 30 minutes to go to work, but some people are okay with travelling for 1.5 hours if the company is good. Would you rather be a strong oak tree that takes hundreds of years to grow, or a small plant which sprouts beautiful flowers for people to fancy? There is no easy answer to work-life balance or money-time issues. One of my friends got into a job where she earns 5 digits a month— but here's the catch, her working hours are extremely irregular and she is usually on-call during the weekends. Imagine going out with your partner and saying, "Sorry - I've got to catch this appointment... hope you understand...". It's really common to define success as monetary incentives, but always consider the tradeoffs . Consider this: do you think that the skills you've learned in your new job would be relevant in 5 - 10 years time? Technology is so rampant these days that it wouldn't be surprising if all the vehicles would no longer need drivers. Do you have plans to migrate overseas or create a startup that would give you no income for several months/years? I feel like there were a lot of added responsibilities after coming out to work - paying bills, feeling the pressure to settle down (your colleagues / friends will ask lots of questions :P), planning a budget and more. 6. Is satisfaction good enough?